Based on reviews from 72,459 users. Learn how our rankings work or see our guide to pink Adidas sneakers. Updated Apr 2019. Since Adidas was established in 1949, the brand has been releasing several innovative and revolutionary footwear not only for athletes’ performance but also for every day and lifestyle wear. As the years passed, Adidas continues to innovate and even collaborates with different celebrities, companies, brands, and boutiques, among others, as they unceasingly deliver comfortable and stylish footwear that will be loved for generations to come. 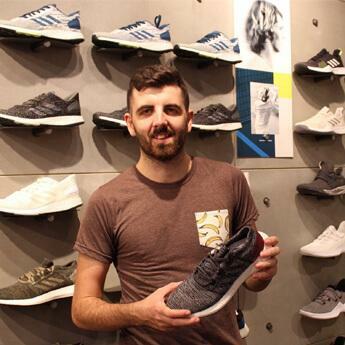 Adidas shoes are available in different style, technologies and colorways to ensure that people would find the perfect footwear they deserve and match their preference. 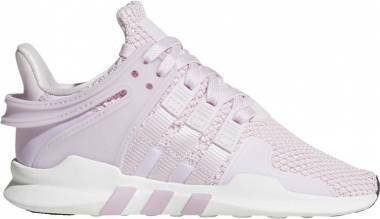 With a versatile style, the pink Adidas sneakers come in a variety of designs and color combinations that especially women can appreciate. Whether a pair of white and pink, grey and pink or baby pink shoes, the brand has launched plenty of designs using different silhouettes that wearers can choose from. With a flexible construction, the reversed sandwich mesh upper is covered by a stretchable web layer. It has the web-wrapped EVA midsole. It utilizes the Ortholite sockliner that delivers comfort and performance. For added comfort, zoned cushioning is installed on the insole. The Trefoil logo is debossed on the premium synthetic suede heel patch. It has a textile lining. It has the lightweight EVA midsole and stretchy mesh lining for comfort. The upper is made of a stretch knit material with TPU details. It has the Ortholite sockliner for supreme comfort. With flat laces, it provides a snug fit. This lace-up sneaker has a closed mesh upper with welded overlays that provides foot breathability. It has the TPU heel cage. The Trefoil logo is debossed on the leather heel tab. It utilizes the lightweight EVA midsole that provides all-day comfort. With a reflective 3-Stripes, it has a breathable mesh upper with a supple textile lining that provides foot ventilation and breathability. It has a lightly padded ankle collar as well as a padded tongue for additional comfort. It utilizes the compression-molded EVA midsole for lightweight cushioning, providing reliable support and impact resistance. It has a rubber outsole that offers flexible traction. The midsole is equipped with the EVA for added all-day comfort. It has a mesh lining for a great next-to-skin feel. It utilizes Ortholite sockliner for performance and comfort. 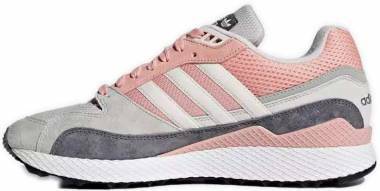 It is among the women’s pink Adidas shoes that have a mesh upper with suede overlays. It has durable rubber outsoles. 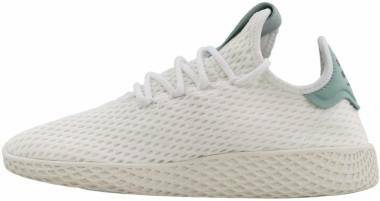 With the sock-like construction, it utilizes the Adidas Primeknit upper that wraps the foot in ultralight comfort and adaptive support. It utilizes the distinctive Boost midsole that delivers the most responsive cushioning. With the signature NMD details, it has the heel pull tab and EVA midsole plugs. An innovative and fold-over tongue provides a comfortable and secure fit. It has a knit upper with a soft linear pattern that offers foot breathability. It has the lightweight EVA midsole. It has a combination of soft textured suede and nylon upper. 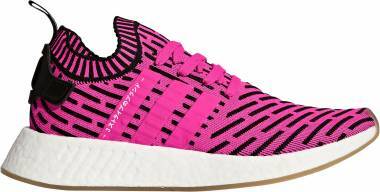 Like other pink Adidas sneakers, it utilizes the lightweight EVA midsole with a distinctive web-wrapping design. 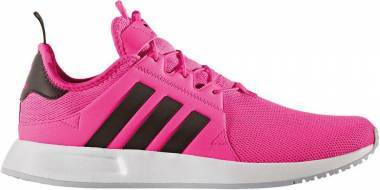 Like other pink Adidas shoes, it utilizes the EVA midsole for lightweight cushioning. The upper is consist of nubuck and nylon materials. It has the 3-Stripes in leather accented on the upper. It has a stretchy textile upper with signature TPU details that offers foot breathability. With a reflective matte finish, the TPU support is installed at the heel. The 3-Stripes in textile is found on the side panel and extends on the midsole. Same with other Adidas sneakers, it uses the Eva midsole that provides comfort. It has a stretchy mesh upper with a matte finish that is accented with mono mesh welded panels. The tongue label with 3D printed Adidas logo is made of pigskin material. 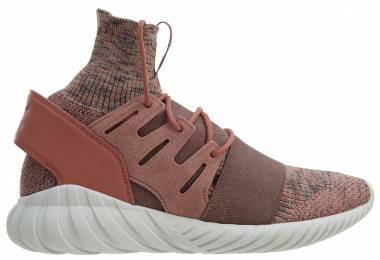 Like other pink Adidas sneakers, it utilizes Ortholite sockliner that provides comfort and performance. It has the EVA midsole for lightweight cushioning and impact protection. It utilizes Lurex yarn in a woven strap. It has an upper made of canvas and suede materials. It has a textile lining for a great next-to-skin feel. It has a vulcanized outsole that delivers precise board feels and excellent traction. Like other pink Adidas shoes, it has molded EVA sockliner. It has a premium nubuck leather upper with 3-Stripes. The roomy toe box area has perforations for added ventilation. It has a synthetic textile lining. The Trefoil logo is on the leather heel patch. The upper is made of a suede material that gives a plush look. It has a reinforced toe box for durability. The supple textile lining gives comfort. The rubber cupsole with a vulcanized look provides reliable traction. It has a tumbled leather upper with perforated 3-Stripes on the sides. It has a leather lining. The leather heal patch is accented with the Trefoil logo. It has the leather lining. It has a leather upper with perforated 3-Stripes. It has a rubber cupsole. With the Boost technology, it provides long-lasting comfort. With hidden stitching, it has a luxe suede upper with the contrasting tongue. It has a synthetic leather ankle collar lining. The Trefoil logo is debossed at the heel patch. This iteration has the adaptive and flexible Adidas Primeknit upper. It utilizes the Pharrell signature sockliner which is inspired by the ancient art of reflexology. With the Boost technology, the midsole adapts to foot’s natural movement. The upper is made of stretchy neoprene on the vamp and tongue. The front, quarter and heel cap straps are elasticized. It has a canvas lining on the forefoot. It has a molded RPU piece where the Adidas logo is debossed. It has the PU and EVA outsole. For added comfort, the Poron sockliner is installed for performance cushioning. Where are Adidas shoes made? Adidas shoes are made in different independent factories. Mostly, the shoes are made in India, Indonesia, Thailand, Vietnam, Turkey, and China. 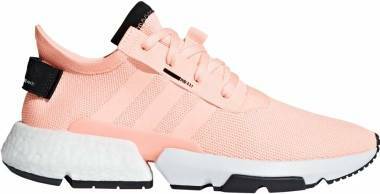 What are some of the technologies used on Adidas pink sneakers? Torsion System – This technology helps the forefoot and rearfoot move independently by providing lightweight arch support. Adiprene – Found at the heel, the Adiprene protects the heel and spares the joints from stress by providing impact reduction. Geofit – The Geofit is small cushions that anatomically found inside the midsole on the ankle area that delivers increased comfort. Adituff – This material is resistant to abrasions, improving the durability of the outsole at high sideways acting forces. BOOST – Apart from comfort, the Energy Boost offers more energy returns which deliver an excellent running experience. Bounce – Designed with the anti-collision protectors of the outsole, the Bounce technology provides stable comfort and doesn’t affect performance whether on a warm or cold environment. Adiwear - The Adiwear is found on the outsole. It is a wear-resistant material which allows the shoe to battle abrasion even at high strain. Supercloud – A sole-sponge material that repels water. It takes the shape of the foot of the wearer to provide supreme comfort. Ortholite – A shoe insert that contains an antimicrobial benefit which leads away humidity, keeping the foot fresh and healthy. Adiprene + - It is found under the toe area which smoothens running and helps at take-offs. 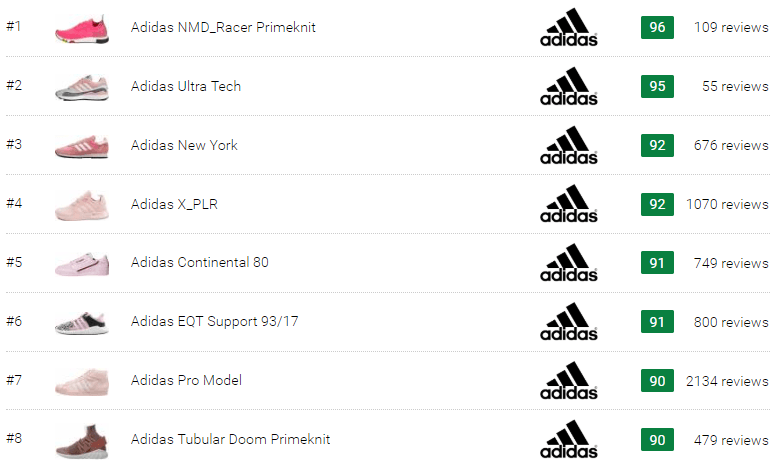 Is the sizing of the Adidas shoe same as that of Nike’s? No, because Adidas sizing converts a little different from Nike and other American shoe brands. Adidas uses a conversion factor of a half size between UK and US sizes. For example, if you are size 7 US on Adidas shoes, then you have to pick size 7.5 US on Nike footwear. What are pink Adidas sneakers made out of? Better Cotton Initiative (BCI) – Sourced from Brazil, Pakistan, Mali, US, Turkey and India, the BCI aims to reduce pesticides used as well as promotes efficient crop rotation, water use, and fair working conditions. Recycled polyester (PES) – Based on post-consumer waste, a synthetic fiber that lessens environmental footprint while improves athletes’ performance. Leather – Adidas sources 99% of its leather volume from non-European tanneries that are audited under the Leather Working Group (LWG). LWG has developed stringent standards, check compliance and audit protocols through independent monitoring tannery sites. What are the best Adidas shoes? What are some of the high-top pink Adidas shoes? Are Adidas pink sneakers unisex? 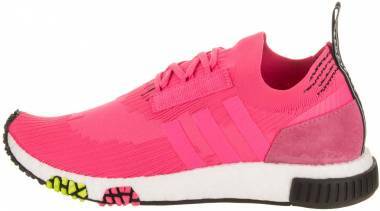 How do you know if pink Adidas sneakers are real? Check out the Adidas logo. The fake product has the descending Trefoil or three bars logo. Fake Adidas shoes have the same serial numbers on the left and right shoes while the real ones have different serial numbers on the left and the right. Fake Adidas sneakers have low-quality finishing like an uneven pattern and shoddy stitching. How to style the pink Adidas shoes? 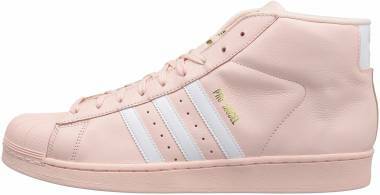 Women can wear a pair of pink Adidas sneakers with light green jumpsuits and light pink jackets. A pair of pink Adidas shoes also looks good with a white mini-dress and optional denim jacket. Ladies can wear their Pink sneakers and match them with a skirt and a grey shirt. Girls can match their pink Adidas shoes with a light pink crop top and distressed denim jeans. Light pink Adidas shoes also match with a pair of black jeans and a white shirt and a blazer. How much do pink Adidas sneakers cost?